Ryoichi Taguchi must defend his WBA Light Flyweight title against his mandatory and former WBA Minimumweight champion Ryo Miyazaki (21-1-3,15 KO’s). This will be Taguchi’s fourth defence since winning the belt from Alberto Rossel in 2014 and is a step up in class after fighting a string of lower level challengers.The two teams have 30 days from last wednesday (8th June)to come to some agreement and being as they were already discussing the bout, it shouldn’t be too hard to come to some agreement. Miyazaki of the Ioka gym is looking to become a two weight world champion after a 4 fight winning streak , but really hasnt been fighting opponents that would deem him a mandatory place. The last person to beat Miyasaki is Fahlan Sakreerin Jr in late 2013. The bout is said to be staged in August although a venue is yet to be decided. 2 years ago Kentaro Masuda and Yu Kawaguchi engaged in a fantastic ,engaging battle that saw Masuda win by technical decision after 10 rounds of action. This time the rematch staged at the Korakuen Hall, was a cauldren of hard punches ,blood and pure will to win. 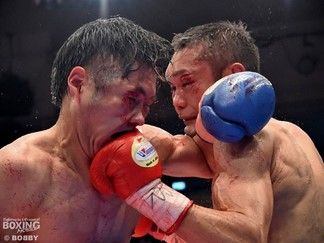 The contest was a real treat for the fans as they witnessed a bloody war for the Japanese Bantamweight title. Both men didnt seem to have much respect for the others style and the action began from the first bell as they both landed meaty shots. The early rounds were very competitve but Masuda was ahead on two judges cards and Kawaguchi was bleeding from the left eye. Sensing that he needed to turn it around, Kawaguchi put the pressure on in round 6 and forced masuda to fight at a higher pace. In round 9 it looked as though Masuda had hit the end of the road as he began to tire, but by the 10th and final round he came out fast and energetic and was ready to go to war for 3 more minutes. Credit must go to both fighters for giving it their all in a close ,bloody battle that saw Masuda come out a split decision winner with scores of 96-94,96-95 and 96-95 for Kawaguchi. Former WBC title challenger Takuya Kogawa will defend his Japanese Flyweight title on July 15th against ranked contender Masafumi Otake, in what will be his 3rd defense in a year. Takuya won the title in 2015 from Shigetaka Ikehara and had two hard defenses against Tetsuma Hayashi and Masayuki Kuroda and looks to have an easier night on paper when he faces Otake. Masafumi has had a long career and has faced nearly everybody on the Japanese circuit and with this being his only shot at the title to date, he will be looking to rip up the script and sail off into the sunset with the title. The bout will be held at the Korakuen Hall as the main event of Dangan 163. As reported in May, Japanese prospect Ken Shiro will be defending his national title against Toshimasa Ouchi , it has been announced that it will not only be for Shiro’s Japanese title, but also for the OPBF Light Flyweight title. The bout is set to take place at the EDION Arena ,Osaka and could be a spring board for a world title shot for Shiro. Ouchi will be looking to become a champion for the first time after only getting a draw against Masayuki Kuroda for the Japanese title in 2012. Powder puff Flyweight Zou Shiming made hard work of his US debut as he laboured to a shut ot decision against Hungarian Jozsef Ajtai ,a man who was stopped in two by featherweight champion Andrew Selby in November. Shimings lack of power seemed to be the only reason why there wasn’t a spectacular knockout as Ajtai looked so scared at times and was content to get on his bike and survive, the crowd became restless because of Zou’s inability to finish .The Hungarian was just looking to spoil and negatively didnt look to for the victory as Shiming took the decision on all 3 judges scorecards with whitewash scores of 100-89. The win certainly won’t do much for Zou’s stock and may have to work on his power in order to get the credit his talent deserves. The Chinese boxer and former 2-time Olympic champion improves to 8-1,2 KO’s, while Ajtai falls to 15-3, 10 KO’s. WBA Super Flyweight champion Kohei Kono and WBA Light Flyweight champion Ryoichi Taguchi will be defending their titles on August 31st at the Ota Ward Gymnasium. The opponents are yet to be announced, but there are talks of each man defending against their mandatories. These would be former WBA Minimumweight champion Ryo Miyazaki for Taguchi and Kono will defend against interim champion Luis Conception. It is more than likely Watanabe will want those bouts for an end of year show. Taguchi is 24-2-1, 11 KO’s and Kono is 32-8-1, 13 KO’s. WBO interim Featherweight champion Miguel Berchelt (29-1, 26 KO’s) is set to defend against Thailand’s Chonlatarn Piriyapinyo (61-2, 41 KO’s) with the winner facing Vasyl Lomachenko for the WBO full title.Lomachenko has already beaten Chonlatarn and the only other loss on his record is to Chris John but is willing to go for his title shot should he win. Both fighters have high Knockout ratios and looks to be a entertaining fight with a few knockdowns. World ranked Yukinori Oguni who is in the running to face the winner of Shingo Wake and Jonathan Guzman of their IBF title fight. Oguni has yet to recieve news on an opponent ,but I imagine it will be a stay busy fight so he can prepare for his shot. Fomer world title challenger will be carrying on his ring return as Motoki Sasaki looks for a third outing on the show . With a record of 40-10-1,25 KO’s Motoki Sasaki will hear of her opponents name sometime this week.